What do you get if you combine a review of the world's first £7000 glasses-free 3D, 4K TV with a review of the best real-world LCD TV we've ever tested? Why, it's the TechRadar reviews section of course! It's been a cracking week for TV enthusiasts, and it doesn't end there either. 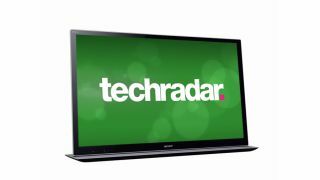 Toshiba continues to amaze us with its 2012 products offering great performance at unbelievable prices, and we've also seen a great TV from Panasonic and the awesome new Android tablet from Asus. Boom! This is the best LCD TV we've ever tested. Sony has had a tough ride in the last few years but after a catalogue of mistakes, it's finally come good in the most spectacular of ways. The KDL-46HX853 takes LCD picture quality to a whole new level, particularly where contrast and motion handling are concerned. The set looks gorgeous too, and features what's for our money the best - or at least the most sensibly focussed - online service around. This all adds up to an achievement made all the more remarkable when you consider that this outstanding TV is being delivered at a more aggressive price than the usually ultra-competitive Korean brands are offering on their range equivalents. To sum all this up, with the KDL-46HX853 Sony isn't just back, it's back with a vengeance. The way the Toshiba BDX3300 doesn't bother to disguise its BBC iPlayer, Acetrax, YouTube and Picasa services as apps is somewhat refreshing, since the functionality is identical to much more expensive - and certainly more polished, usability-wise - smart TVs and Blu-ray players. When it comes to pure Full HD picture quality, the Toshiba BDX3300 delivers, and we also like the fact that it can support an awful lot of digital files via USB and over a network. It may lack finesse and at times appears a tad archaic, but we can't find it within us to criticise anything on a super-slim Blu-ray player that combines the best of the smart TV landscape with a price that hovers under £80/£120. For a simple 2D Blu-ray upgrade with some YouTube goodness, we can't recommend the Toshiba BDX3300 highly enough. You can't release a £399, 10.1-inch tablet and not expect comparisons with the iPad, so we'll cut to the chase. The Asus Transformer Pad TF300 is currently one of the best 10-inch Android tablets you can buy, and represents better value with equivalent performance than the Asus Transformer Prime. The top-notch benchmark scores, wonderful use of the keyboard docking station, excellent battery life and superb usability make it a top recommendation in our eyes. If you're platform agnostic and are tossing up between this and the iPad, things get trickier. The Transformer is better value, has double the storage, a fantastic keyboard dock which makes it much more versatile, and Ice Cream Sandwich closes the gap hugely. Individual needs and budget will determine if the Asus Transformer Pad TF300 is right for you, but we applaud Asus for marrying value and performance, and the TF300 comes highly recommended. The TX-L42DT50B is a relatively high-end TV - that much is obvious from its slim depth and metallic bezel, the latter of which is some achievement considering Panasonic's rather lacklustre history in this department. Feature-packed inside, we're able to detect that this isn't the brand's flagship set, but there's really no major flaws aside from a stubborn refusal to include 3D specs. It's a decision which rather underlines why most brands - including Panasonic, to some extent - is quickly turning to passive 3D system with its 99p 3D glasses. Toshiba's 55ZL2 is designed to get any tech obsessive's pulse racing. After all, it breaks new ground in not one but two huge areas. First it can genuinely produce a watchable 3D picture without you having to wear glasses. And second, to help it achieve its first innovation, it employs a native 4K or Quad HD pixel resolution for the first time on a domestic TV.